If you dream of a bathroom that's indulgent and relaxing, a space where you can unwind after a long day, find inspiration with our pick of beautiful luxury bathrooms. Whether you're designing a bathroom that's traditional, contemporary (or anything in between), what's important is prioritising quality sanitaryware; stylish fixtures and fittings and opting for materials and designs that stand the test of time. Regardless of your budget, there are always options for incorporating luxurious features when planning and designing your bathroom. For a luxe bathroom with a timeless feel, consider opting for chrome fixtures and fittings. A great accompaniment to a marble scheme, chrome makes an understated addition to a bathroom that's guaranteed to stand the test of time. We love this Double Crake Vanity Basin Suite from Drummonds and can't imagine not feeling (at least a little bit) glam getting ready in front of it every morning. If you like the idea of a luxurious bathroom without the extravagant opulence, consider opting for a more minimalist-inspired luxury. Simple silhouettes and well chosen materials – think hardwoods and concrete finishes – can create a soothing and luxurious feel when combined. Complete the look with industrial inspired light fittings and a statement freestanding bath. Find this Box Wall Light at Original BTC. 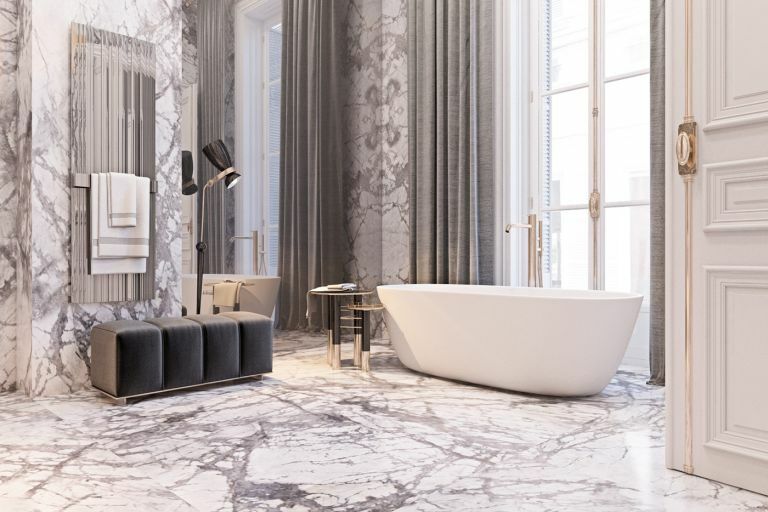 Marble is the go-to material if you're looking to design a bathroom that oozes sophistication, opulence and luxury. A light coloured finish will make a bathroom seem large and light, particularly in a space with high ceilings and large windows. Couple with white sanitaryware for a classic feel. Combining stylish patterned floor tiles with classically luxe features – a statement mirrored wall and freestanding bath being great examples – is a great option for designing a bathroom that is unique and full of character, yet luxurious. We love this combination of statement wall and floor tiles with this lacquered finish Tay Bath and Dalby Shower, both from Drummonds, for a unique and modern twist on a luxurious bathroom. Practical and luxurious, double sinks are reminiscent of high-end hotel suites and are a worthy addition to a bathroom shared by busy couples. We love the way brass fixtures complement the darker, more industrial feel of this bathroom by Merlyn Showering. Find out more about choosing your bathroom sink in our guide. Another example of bathroom indulgence, a statement double shower makes for a truly luxe addition. By keeping the shower fittings relatively simple, there's ample opportunity to make a statement with unique tiling. We love this use of white hexagonal tiles and the addition of a recessed shelf unit. Recreate the look with Merlyn Showering. If you want anymore advice on how to choose a stunning shower enclosure, just check out our guide. In addition to creating the illusion of a larger and lighter space, a mirrored wall enhances the luxurious feel of a bathroom. This is particularly effective if positioned so that statement lighting or a freestanding bath are reflected. If your bathroom is blessed with original features, it's worth ensuring that you're emphasising them as examples of traditional craftsmanship. This will, in turn, add to the high-spec feel of your space. Simply positioning a traditional roll top bath in front of a dramatic original window will draw attention to it, creating a focal point. Bath and sinks by Roca. A classic, all-cream scheme is an elegant option for a country bathroom. Emphasise original features and ensure that new additions are in keeping with the traditional style for a luxurious look that suits a period property. A reclaimed fireplace and timeless freestanding bath make luxurious additions to this country cottage. If you love this bathroom, you are definitely going to want to check out more of our traditional bathroom ideas. If you want to create a luxury feel in your bathroom but are limited by budget, investing in one statement piece can be an effective solution. We'd recommend tackling the area around the hand basin, which can function as a focal point and make a dramatic difference to the feel of a space. We love the striking combination of this nickel finish, freestanding Hebdern Vanity Basin (available at Drummonds) with a stylish mirror and industrial inspired wall lights. Style with delicate house plants and good quality hand soap to enhance the luxurious feel. For ultimate privacy – and a gorgeous design statement – invest in luxurious window treatments. Nothing wrong with blinds, of course, but shutters, in our opinion, add an Old World elegance to any bathroom. This bathroom with shutters is in a restored mansion in Hampshire and is by Drummonds, from £3,570. Want more options before you decide? Browse through our bathroom window treatment ideas. House your towels and toiletries in finely crafted fitted cabinets for ultimate formal elegance. This monochrome bathroom with fitted furniture is by Scavolini. Find our more about choosing bathroom furniture. To make your bathroom look and feel warm and cosy, accent with upholstered seating and decorate in almost the same way you would a bedroom. Think boho painted furniture and wall art. Explore more brilliantly boho design ideas to get inspired. This country farmhouse bathroom in Devon is by Drummonds. A loft conversion can provide an excellent space for a luxury bathroom. Not only does a loft offer extra privacy, but also plenty of opportunities for a clever, bespoke layout. We like the way in this loft bathroom, the corner is utilised for a shower, while the bathtub rightly occupies the sunny spot by the window where headroom is less generous. Find more about the practicalities in our beginner's guide to loft conversions. There's nothing like beautiful tiles for adding texture and visual interest to your bathroom. Go for both floor tiles and wall tiles for a really stunning effect; pick glossy finishes for the walls to reflect light and a practical matt finish for the floor for contrast. Find our how to choose bathroom tiles in our guide. To create a serene, elegant space, choose bathroom paint colours carefully. If your bathroom is on the smaller side, pick a deep, mid-tone colour that won't make it feel too small, and ensure your bathroom lighting is well-planned so that it's bright in the evenings and on dark mornings. This dove-grey bathroom looks calm and inviting, and features shutters by Apollo Blinds. We have more bathroom paint ideas for you to explore. Introduce a bespoke, playful element with a wall mural. To keep the design scheme smart, try matching the colour scheme of the mural to the colour scheme of the bathroom furniture. This bathroom with a mountain mural is by Delightfull. Find more mural design inspiration in our guide. If you already have a beautiful space that doesn't require too much design-wise, you can really concentrate on investing into the perfect tub. You could do worse than a shiny metallic number, made from tin, nickel, or copper. This luxury bathroom is by Hoban Design. Zone the space, separating the showering area from the bathing area. For some of us, the height of luxury is simplicity: if your dream bathroom is unfussy and serene, look to Scandinavia for inspiration. Think a minimal design with blond wood flooring, and a cosy accessory such as a sheepskin. This Scandi-inspired bathroom is by Catchpole & Rye. Love Scandi style? Check out our cosy Scandi room design ideas and stylish New Nordic design ideas. If contemporary minimalism is your definition of luxury, consider adding a wet room, which is as streamlined and fuss-free a bathroom option as they get. You can also experiment with more contemporary materials; this wet room, for example, has been fitted with micro-cement walls and floors.